YADAH captain Jimmy Dzingai says he overreacted when he threw back objects to fans in their 1-1 draw against Dynamos at Rufaro on Sunday. It was a tense match and Yadah were still leading 1-0 before the captain lost his cool. “I apologise for what I did on Sunday, I know it is wrong to react the way I did to the fans, the fact is that I overreacted, I can’t even remember what came in my mind when I threw back the object,” Dzingai told H-Metro. “I think that was the first and last time to do this especially as the team captain. I know I did something embarrassing to my fellow teammates as well as the coach, but it happens, I am a human being, I react. “I also apologize to my prophet, Walter Magaya for what I did; I know he was obviously not expecting that from me as a team captain,” he added. After he saw red, Dynamos had a one man advantage and they equalised through Kuda Kumwala. “Of course we were leading 1-0 when I was shown a red card but we cannot conclude that my red card was to blame for the result. “I can say my red card was nothing because the guys were performing well with ten men. 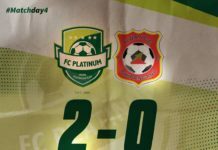 “We had a chance to win the game but after the missiles incident, Dynamos gained the momentum and scored,” said Dzingai. Dzingai hopes the relationship between fans and players improves. “I think Dynamos fans should also end this system of frustrating their players because actually this is not the way to go. “This has become a system for the Dynamos fans, they did the same against Highlanders, so they should stop it because that cannot bring any results to the team. “We have played only six games so far, so Dynamos fans must not be too embarrassed because they can still be champions for 2018,” said Dzingai.